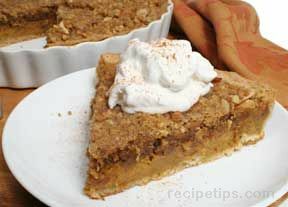 A very enjoyable, nutty streusel pie with a buttery cookie crust. Mix flour, sugar, lemon zest and salt in a large mixing bowl. Add the egg and cream mixing on low just until combined. If dough seems dry, add cream 1 tablespoon at at time until it reaches the right consistency. Spoon pumpkin into mixing bowl. Add eggs one at a time until incorporated. Add both sugars, flour, ginger, cinnamon, cloves and salt. (plus 1/4 teaspoon of nutmeg, optional). Whisk in heavy cream and apple juice. Combine flour, sugars, cinnamon and salt in a medium sized bowl. Add chunks of butter and mix with a fork until it resembles crumbles. Stir in walnuts, almonds and crystalized ginger. Postition rack in the middle of the oven and preheat to 350°. If dough is refrigerated, warm it up on the counter for 5-10 minutes. Roll out on floured surface into a 13 inch round. Drape over a fluted pan or pie plate. Fit the dough into the flutes and to the top of the dish. Pour filling mixture into unbaked crust. Scatter streusel over the top. Bake until topping is evenly cooked and no longer wet in the center, 60-70 minutes. Let cool on a rack for at least 2 hours or refrigerate overnight.